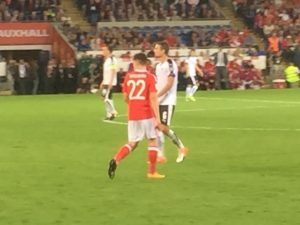 This game in the World Cup qualifiers was a must–win game for Wales if they wanted to keep their hopes of reaching the World Cup in Russia alive. Before this game, Wales had won one game and had drawn five. There were lots of missed opportunities during the first half for both sides. It was a frustrating arm wrestle, in which both sides’ defenses were like brick walls. The first half ended with no goals to separate Wales and Austria. I’m not sure what Chris Coleman said to his players at half time but as the second period of play kicked off, you could see that Wales had more of an urge to win and had much more energy and determination. Chris Coleman changed his familiar 5-4-1 formation to a 4-2-3-1 formation which worked because it was a more of an attacking formation. What this game desperately needed was some attacking in what had been a very defensive game. 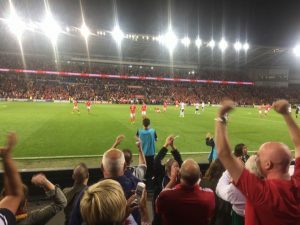 Up until the 74th minute, it was still Nil-Nil, but Wales were looking the better team. Changes were made as Hal Robson-Kanu and Ben Woodburn came on. The home side needed something special. Cardiff City Stadium roared the national anthem to try and inspire the players. I am pretty sure this was the moment I lost my voice as I watched from the stands. Virtually immediately after the anthem ended, the teenage sensation from Liverpool, Tom Woodburn, sent a screamer into the back of the net from 20 yards out, and all this on his debut for his country. The stadium went crazy! The game remained 1-0 until the final whistle. There were more chances where it looked likely to become 2-0, for example, Gareth Bale’s bicycle kick, but it did remain 1-0. Ireland also drew against Georgia earlier in the day. Wales’ chances of reaching the World Cup are very much still alive but they remain 3rd in the table. Welsh football has also found a new star in ‘Super Ben’ Woodburn. There are three games left and Wales just have to keep winning. The next game is against Moldova on Tuesday evening at 7:45 pm.